The angle was such that Moorhead coach Dave Morinville, standing on the Spuds’ bench, had the ideal vantage point for the game-defining play. Not that it was a particularly pleasing view. 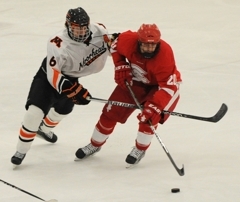 Cruising near the top of the left face-off circle, Benilde-St. Margaret’s senior forward Jake O’Borsky launched a shot that sailed over the glove hand of Moorhead goaltender Michael Bitzer. 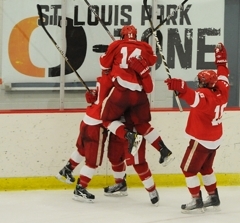 The victory advances Benilde-St. Margaret’s into the championship game against undefeated and No. 3-ranked Maple Grove at 7:30 p.m. on Friday at the St. Louis Park Rec Center. 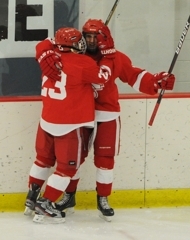 A 6-foot-1, 190-pound wing who is the epitome of a power forward, O’Borsky has scored eight goals and tacked on nine assists in eight games for the Red Knights this season. That continues his pace for a marked improvement from last season, when he scored 12 goals and had 11 assists in 24 games. “He is kind of developing into what we thought he would be last year,” Benilde-St. Margaret’s coach Ken Pauly said about O’Borsky, who moved with his family from Red Wing, where he was a dominant force at the youth and high school levels. “He’s maturing, and a lot of that is confidence with him and having fun. O’Borsky’s goal came with 1 minute, 18 second left and just moments after Moorhead had a similar chance to take the lead. 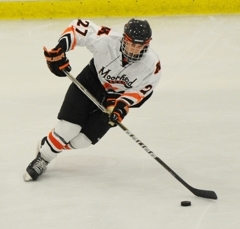 Senior forward Logan Ness, Moorhead’s leading scorer last season, had the puck and ample space and time in the slot. He ripped a rising shot that was headed toward the left corner of the net before thudding into the pads of perfectly positioned Red Knights’ goaltender Anders Jecha. The back-and-forth sequence was a microcosm of the game, which had multiple momentum shifts and scoring chances for both teams – the end-to-end action coming in waves. While Jecha and O’Borsky assumed starring roles, so too did Bitzer and Ness. Both Moorhead standouts took the loss hard. Jake O’Borsky scored with 1 minute, 18 seconds remaining and Grant Besse added an empty net goal as No. 8-ranked Benilde-St. Margaret’s held off No. 9 Moorhead 5-3 on Wednesday, Dec. 29, to advance to the championship game of the Sports Authority Holiday Classic at the St. Louis Park Rec Center. O’Borsky’s goal came on a blast from the left face-off circle, beating standout Spuds goaltender Michael Bitzer over his catching glove. 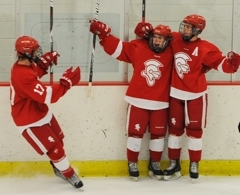 The victory sets up a title showdown between Benilde-St. Margaret’s (7-2-0) and No. 3 Maple Grove (10-0-1), which beat Wayzata 4-2 in Thursday’s other semifinal. Besse scored a shorthanded goal 77 seconds into the first period before adding the empty net goal with 1:00 remaining. 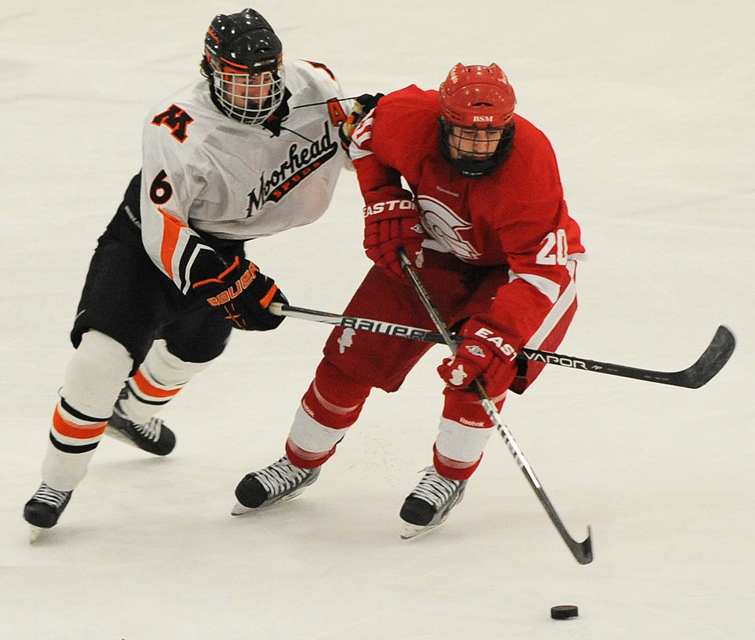 Moorhead (7-1-0) tied it at 3 with 5:10 remaining in the third period when defenseman Ben Welle ripped a shot from the point that deflected off a Benilde-St. Margaret’s player’s skate and skidded into the goal off the right post. Before Welle’s goal, it appeared junior forward Dan Labosky’s goal late in the second period would hold up as the gamer winner. Labosky scored after a 3-on-1 fizzled and the Red Knights’ failed to get a shot on goal. But the puck ended up deep in the corner, and after some bumping and grinding on the forecheck by T.J. Moore and Grant Besse, the puck popped free to Labosky at the side of the net. Goals by Grant Besse and Chase Jungels gave Benilde-St. Margaret’s a 2-0 lead just 6:11 into the opening period. Sophomore Aaron Herdt scored for Moorhead late in the second period and again early in the third to tie it at 2. Moorhead's Logan Ness had a golden opportunity to score just before O'Borsky's goal, but Ness' hard shot was turned aside by Red Knights goaltender Anders Jecha. 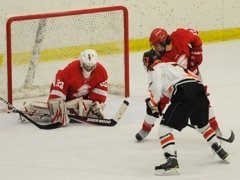 Bitzer made 24 saves for Moorhead, while Jecha finished with 27 for the Red Knights. The senior forward pulled his team out of a slow start to the third period and ignited the Red Knights with a game-winning goal. O'Borksy streaked down the left side of the ice and snapped a top-shelf goal with only 1:18 left to play to put Benilde-St. Margaret's up for good. He now has eight goals and a total of 21 points on the season. Star forward Grant Besse continued his phenomenal season with two goals and an assist in the Red Knight's victory over Moorhead. He scored a shorthanded goal within the first minute of the game and tapped in an empty net goal during the last minute of the game. He leads the Red Knights with 24 points (8 goals, 16 assists), matching the point total of line-mate and star forward Christian Horn. 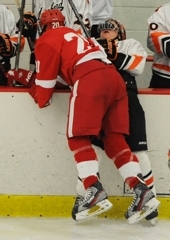 Herdt scored two huge goals in the Spud's loss at the end of the first and beginning of the second period. 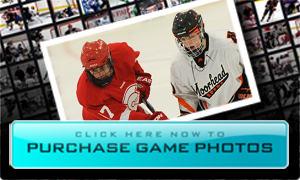 His goals energized Moorhead and he singlehandedly brought them back from a 2-0 defecit. The sophomore forward has seven goals and eight points on the season.